Thame is the most idyllic of English market towns. A famously broad High Street, a clutch of charming pubs – even if some of the names have been changed in the most ahistoric manner – and some genuinely interesting shops mean that it’s a perfect place for a lazy, summery afternoon. Booklovers ought to flock to Thame. The town has always had an arty feel to it; drama and music flourish. There are a few decent independent coffee shops – I’m quite a fan of Time Out, a slightly bohemian place and reasonably priced. There’s an annual festival of literature, and the Spread Eagle Hotel – haunt of author of Brideshead Revisited Evelyn Waugh – was famed for its literary lunches as far back as the 1920s. The Oxfam bookshop has a very literary bent to it and like much of this corner of Oxfordshire, it’s not unknown to stumble on the filming of The Midsomer Murders. But it’s to the Book House that readers flock. It’s independent and its owner is sometimes to be seen. 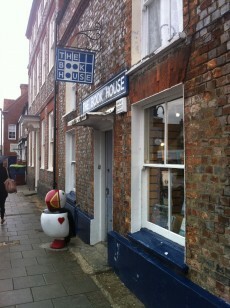 At the bottom end of the lower High Street, the Book House is literally a house which has been converted into a shop. With a Georgian front, attractive signage and tasteful windows, everything about this shop says individuality. Inside, though much has been modernised, there’s still a delightful quirkiness: exposed beams and uneven floors do mean customers need to be alert! Strikingly, the rear of the shop is a modern airy room, with seating in a courtyard garden (which customers are encouraged to use), which contrasts tastefully with the more historic parts of the building. The shop is rarely empty – there’s a gentle busyness to the place, enough to stop that awful oppressive quietness that can afflict smaller shops, and customers range from elderly ladies who lunch to school kids – the Young Adult section is particularly impressive and almost half of the shop is given over to children’s books: there’s a firm commitment to nurturing the younger generation of readers. Above all, it’s for the judiciously selected stock that readers come here. It’s different. There’s a range of the latest literary fiction, a small but informed selection of poetry, ample books with a local flavour and an exceptionally well chosen range of books in almost every other subject – you’ll find school textbooks, recipe collections and tomes of history, plus a few Art House cinema DVDs. No, despite over 20,000 titles in stock, you won’t find everything here – but what you will find will interest and you often won’t find readily elsewhere, so it’s great for gifts. A sizeable corner sells upmarket notebooks, notelets and greetings cards, generally beautiful if perhaps slightly feminine in their design; well priced, they’re certainly individual – lino prints, acrylics of swirling seas, handmade… you get the idea. The stock as a whole is regularly updated, often with a seasonal feel. At Christmas, the shop can be positively heaving – customers seem to love its charm – and it does a great line in non-chocolate, traditional Advent calendars. That alone gets my vote. This is a shop determined to resist the internet muscle of the big boys. Most titles in print can be ordered and collected from the shop within 24 hours. No, you won’t find Amazon style discounts here, but the loyalty card for customers spending over £10 on a visit makes splashing out even more tempting. 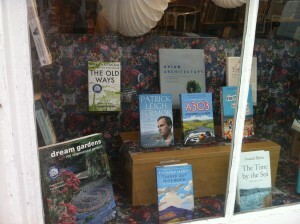 And towns like Thame need shops like the Book House. Such businesses bring a sense of individuality and it’s why shoppers still head there, and preserve the town as a thriving local hub. As they say, use such shops or lose them. I have forgiven The Book House for not giving me that Saturday job when I was in the Sixth Form at Lord Williams’s.